Over the decades that Vincent van Gogh painted, he has tried to cover as many genres – from portraits to landscapes, to still life paintings. The popular still life subjects he has covered include shoes, chairs, bottles, and most importantly the flowers. From the sunflowers, irises, and roses, van Gogh brought to life all of his emotions to his work. He took the subject matter under a brand new perspective as he sees it. He painted the Vase with Honesty sometime in 1884, and would continue to paint more flowers all throughout his career. Van Gogh works on selling his painting for him to earn a living, and as such money has always been scarce. 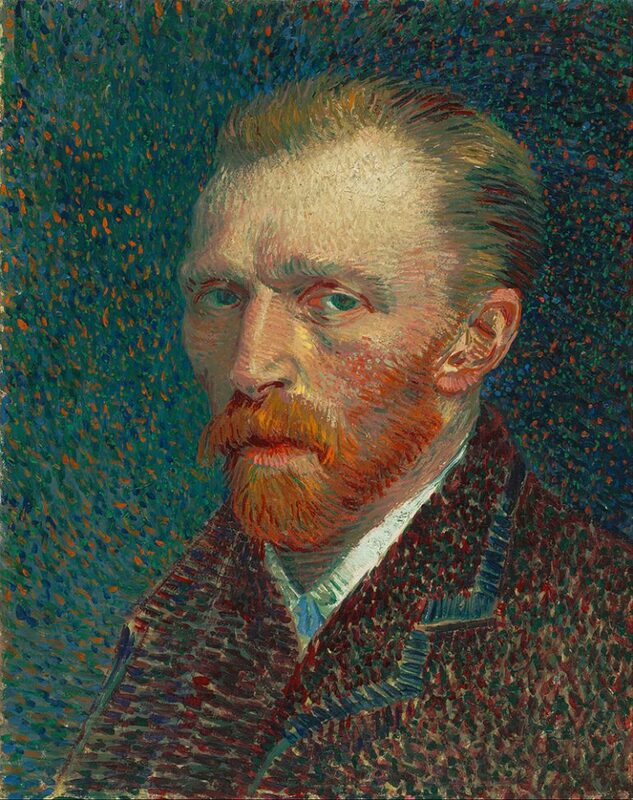 The story of Van Gogh would not be complete without a short mention of his mental illness. Today’s mental health experts note that he had episodes of depression and anxiety, and symptoms of bipolar disorder. In retrospect, his paintings were a journal of his life and his struggles with his mental illness. Doctors at the time would not have been in a position to address his condition. His letters to his brother as well as chronicles of his activities can only give us clues of his condition. The biggest clues however were his paintings. The big vibrant colors, the blue swirling skies, the explosive stars, his flower paintings were all indicative of his mental health at the time he made them. Sometime in 1885, Gogh was painting darker portraits and images. Later on he moved to Paris and was encouraged by his sibling to paint brighter more colorful paintings, and so he started creating flower paintings by 1886. Although the paintings were predominantly dark, he added brighter colors as you can see from his popular paintings the Glass With Roses and vase, and the Carnations. The following year, he started creating brighter paintings. His landscapes, self portraits and flower paintings showed subdued hues, softer colors, and lighter backgrounds and they all showed his amazing brush strokes. In 1887, he created his flower masterpieces the Daisies and Anemones, and Vase with Lilacs where he showcased flowers and blue vase set on a soft blue and lavender backdrop. This was the time in his career when he was adding color to his artwork. While in Arles, van Gogh was excited and looked forward seeing to his friend Gauguin and paint with him. In preparation for his arrival he painted Sunflowers to add some color to the house. It was one of his popular flower paintings and has been depicted in many of his collections. 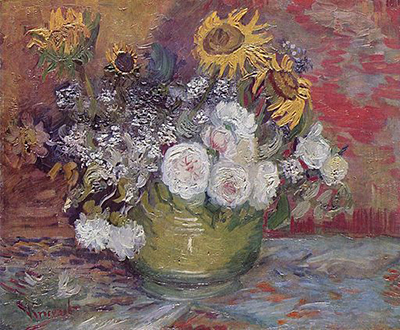 Later in 1888-1889 he made a Sunflower painting in a yellow vase showing the flower in varying degrees of life; from blooming, to opening, and some withering or dried up. Arles was a traumatic phase in van Gogh’s life and so while in an asylum, he painted the Irises he found in the garden. Vincent showcased a row of blue irises on bright green leaves and stems. Theo was impressed by the marvelous painting that he entered Vincent’s work at the Salon des Indépendants of 1889. Sunflowers and Irises became one of Vincent’s well-known painting. Eventually, van Gogh felt well and recuperating from his illness. Before he left the asylum he felt that he would no longer be depressed or have any mental episodes. Prior to leaving in May 1890, he painted the artwork Roses. Here he showed a vase filled with roses in full bloom, where some spilled over the edges falling from the table. The pink roses were shown in contrast with the green table as well as yellow background. While Sunflowers had the welcoming emotion that Vincent felt when his friend Gauguin was coming, Roses depicts the positivity and hope he felt for himself as he was about the leave the asylum. Several of his flower painting reveals his penchant for the various stages of life, but not Roses. Here he revealed flowers full of life and all pretty in bloom. His critics say that the green leaves and pretty roses in full bloom shows rebirth for Vincent, and this was the emotion he tried to show in his flower artworks – the start of a new life; full of optimism and hope.